Imtiaz Ali may be only three films old but he is already a name to reckon with. The director of films like Socha Na Tha starring Ayesha Takia and Abhay Deol, and Jab We Met starring Kareena Kapoor and Shahid Kapur is now ready with his upcoming film Love Aaj Kal starring Saif Ali Khan and Deepika Padukone. He tells his fans more about the film in a chat last week. For those who missed the chat, here's what transpired. 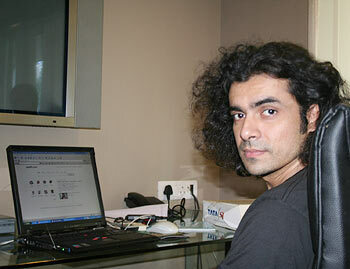 Imtiaz Ali answers, Hello, this is Imtiaz checking in. Will answer questions now. bienu asked, hi Imtiaz Are you concerned over the high expectations from Love Aj kal as Jab We Met was a surprise package. Imtiaz Ali answers, Luckily there is so much work to be done in the making of a movie that there is no time to get nervous. I have been told that there are a lot of expectations from Love Aaj Kal, but I can't do anything about it. I can only try to make the movie as well as I can, and that's what I've tried to do. And I had fun. Imtiaz Ali answers, Hi. to you and to everyone who has talked about Jab We Met -- Thanks. I get a little embarrassed with praise. But thanks -- really. 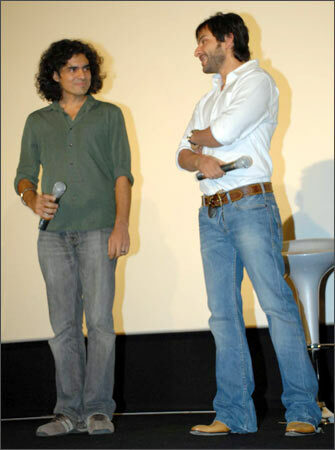 Imtiaz Ali answers, Saif is the most challenging actor I've worked with. His mind works very fast. He has a million ideas in his mind and to make sense to him, you've got to be at his speed. That was fun. But what was remarkable was his humility. He does not think he is a star or anything. He is one of the most humble people I've met. He is a cool guy. KSMRAJU asked, some scenes in jab we met were just like it is happening in our families. Imtiaz Ali answers, Since I grew up in a middle class family, I guess. harita asked, Hi Imtiaz whats your qualification. I am just asking this becoz, the story of jab we met being not so new, still had a very pleasant falavor.Are you any masters in movie making? priya asked, hi imtiaz, r u there. Imtiaz Ali answers, yes Oriya I'm here. mediashri asked, Hi Imtiaz, loved ur Socha Na Tha and Jab We Met. I also liked ur acting in Black Friday. Would like to tell that both ur films had emotional content that was slice of life and struck a chord with the audience. Just want to ask you that would you consider making a film on inter-caste romance as that seems to be happening a lot amongst today's youth and people are caught between love and family. Just a suggestion..looking forward for Love Aaj Kal! The song "Yeh Dooriyan" is superb...hits the heart with its music and lyrics. Way to Go! Imtiaz Ali answers, I feel the story finds you, rather than you finding it. Also Ye Dooriyan is my favourite track of Love Aaj Kal. Imtiaz Ali answers, Nothing decided about the next movie. anshul asked, does saif has a double role? priya asked, u look great with long hair and that white shirt i saw u in. i became a great fan of urs. Rajesh asked, imtiaz get your haircut done dude!! Imtiaz Ali answers, I'm waiting for more people to tell me to get my hair cut. Than I will. zzzzzz asked, Dear Imtiaz, plz let me know if you are planning to take a new comer girl in future for your movies if yes plz send me ur email id. Imtiaz Ali answers, I'm not planning a movie with new actors at this point. All the best. Imtiaz Ali answers, All the best to you and to everyone here who aspires to be in movies. I also have a page on Facebook, by the way. Prateek asked, Hi Imtiaz , am really an avid fan of your (vibrant style). Just wanted to ask that 3 word movie (e.g. Jab We Met , Love Aaj Kal) is some kind of a Lucky charm??? Imtiaz Ali answers, Just turned out this way. And I thought just because there are three names in Love Aaj Kal can not be the reason for not using it. Imtiaz Ali answers, Geet. Nice name. raziahalim asked, why on earth did u disclose so much about the story of your movie LAK in an interview with etc? Imtiaz Ali answers, Is this really Razia Apa? Imtiaz Ali answers, Jai and Meera are seeing each other in London in 2009. Veer Singh, played by Rishi Kapoor, sees them and finds the modern procedure of love relationships ridiculous. He narrates the love story of his youth in Kolkata and Delhi in the 1960s. We see this in flashback in which Saif plays the young Rishi Kapoor. Both stories run parallel in the film. nickita asked, why did you choose saif and not any other hero? Imtiaz Ali answers, I was looking for a modern, quick-thinking, bright, sharp London living actor. Ejaz asked, Hi Sir, Whare r u leaved in Jasmhedpur.... In Dhatkidih??? Veerapan asked, You're pretty known to make some offbeat romantic movies. Keep up the good work. Movies like Socha Na Tha and Jab We Met had a fresh flavour to them and great acting in those movies. Just a suggestion. Sometimes Directors get carried away with money and rope in bigger stars and more stars to make the project bigger to rope in a bigger audience. Please avoid that. Cause because of that the Director's creativity goes for a toss and all that they then think about is Money. I dont know whether you agree with my logic. But that's how I feel. Cheers to you !! Imtiaz Ali answers, Thanks. Will keep that in mind. You try to get legal too, Veerappan. Nikunj asked, Hi Imtiaz.. In your films your try to give Punjabi touch...in terms of culture, language, dialogues and songs...Do u think this idea has potential in long term? Imtiaz Ali answers, I am attracted to the vibrance and spirit of Punjab so there is Punjab in my movies somehow. But might not be there in the future. Mohit asked, Imtiaz- This is Mohit Misra. Good to hear about your incredible success. Imtiaz Ali answers, Moti... Really... Hope you are rocking. Heard about your international marriage. See you soon. seema asked, imtiaz u r so sweet that u said u will answer gals questions first, so these guys are jeleous. Imtiaz Ali answers, I hope not. Kusuum asked, Luvd Jab We Met, are you really planning a sequel??? Imtiaz Ali answers, Not yet. LAAJOKAADADAJEE asked, LMTIAZ ANY HOT SCENE IN YOUR MOVIE ? Imtiaz Ali answers, Unfortunately not. vijay asked, Hi Imtiaz have you ever considered acting in movies? Imtiaz Ali answers, Not interested in acting. Imtiaz Ali answers, Fast enough now? iyerma asked, hi imitiaz... it was wonderful jab we met... good luck for LAK.. i have twin boys namely ayush and ashray..kindly give your blessings..
Imtiaz Ali answers, I'm not where you have to bless. But all the best wishes, all the love to Ayush and Ashray and to you. Imtiaz Ali answers, Hope so too. kakaji asked, which is the highest peak in india? red asked, every man also wants to act in the film they make like subash ghai. do u ever want to or will act in films u make?? Imtiaz Ali answers, I am very happy directing. Imtiaz Ali says, Hey all. It was really nice chatting with you. I'm off now. Hope you like Love Aaj Kal. It is releasing on the July 31. Find a way of letting me know what you thought of the movie. Bye. Zindabad.